The dining room is bright and full of Craftsman details like the boxed beam ceiling, wainscot, plate rail, and built-in buffet. Wainscoted entry offers hooks for coats and bags, and a bench for removing shoes. 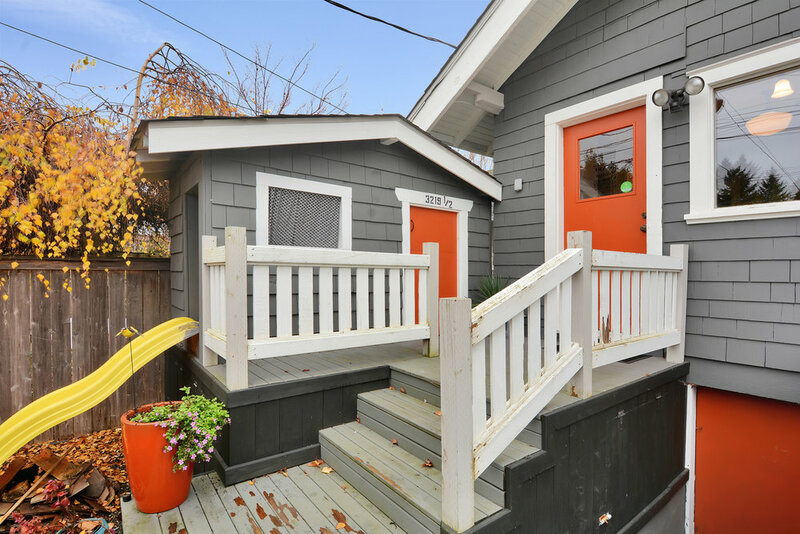 In a classic North End neighborhood this true Craftsman bungalow is ready to be yours. Location and enduring style meet in this beautifully crafted home just 2 blocks from the the University of Puget Sound’s parklike campus. The dining room alone features built-ins, wainscoting, boxed beam ceiling, and the glowing fir floors found throughout. Craftsman enthusiasts will recognize other custom details like a pocket door and granite fireplace in the living room, distinctive wide trim, picture rail and crown molding, and - of course - the wide front porch with its tapered wooden posts and brick detailing. 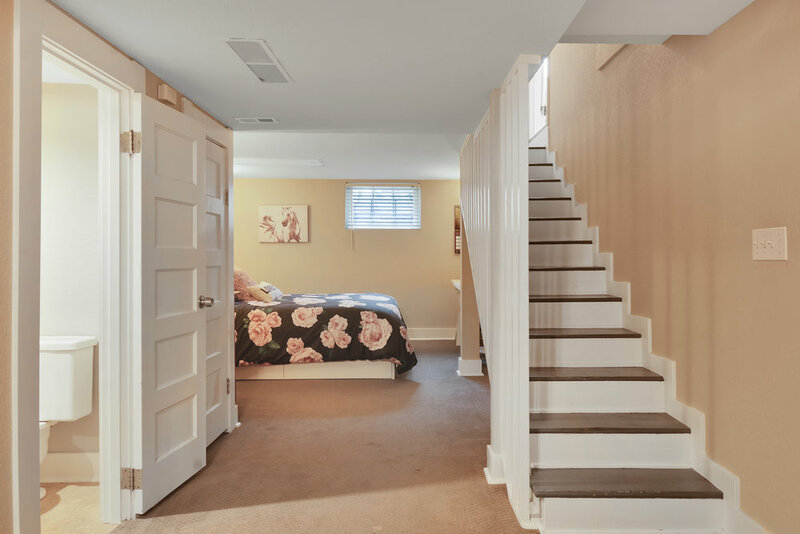 A finished basement greatly increases the living space, while stairs lead up to an unfinished attic that’s full of potential. 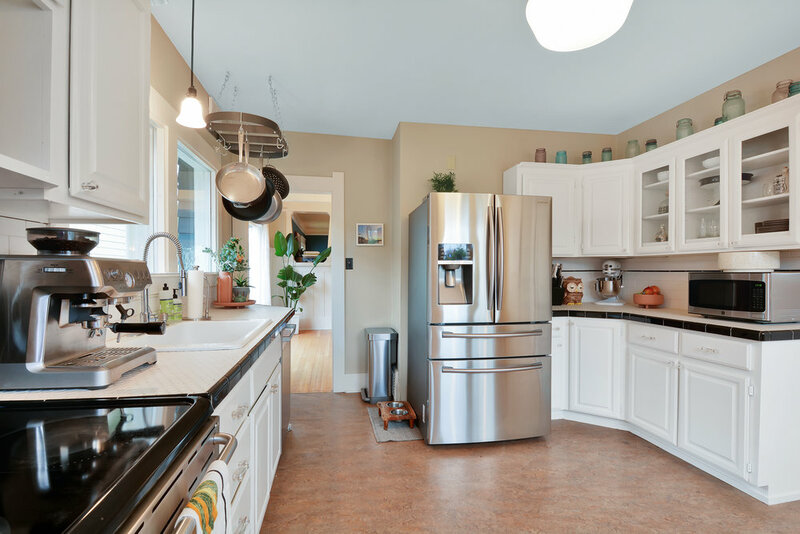 In addition to charming original details, find a furnace, heat pump, and water heater all new in 2016. Less than a mile from Proctor and under half a mile to the 3 Bridges District, these two nearby neighborhoods provide independent coffee houses, groceries, shopping, schools, parks, and seasonal community events. Spacious living room with granite fireplace, fir floors, pocket door, and picture window. The living room (shown here with pocket door open) flows into the dining room. Notice the built-in shelves and picture rail. 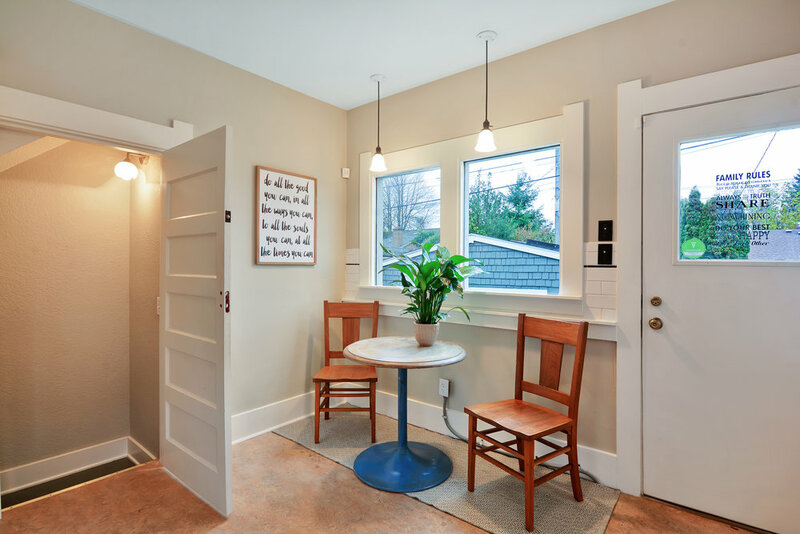 From the wide, welcoming front porch step into a bright entry where convenient coat and purse hooks, and a built-in bench provide a place to pause and unload. From here, take a right into the large living room where fir floors, and built-in details continue. The wide white trim and beautiful light compliment the deep tone of the walls, and once you see the granite fireplace, you’ll probably want to sit and stay a while. A pocket door slides open to reveal a cozy music room. Another living room view featuring the oblong window and showing-off the colorful fir floors. Spacious enough for a dining table and sideboard, this beautiful room fills with natural light from the picture window. The dining room, situated just where it ought to be between the living room and kitchen, is one of the best rooms in the house. 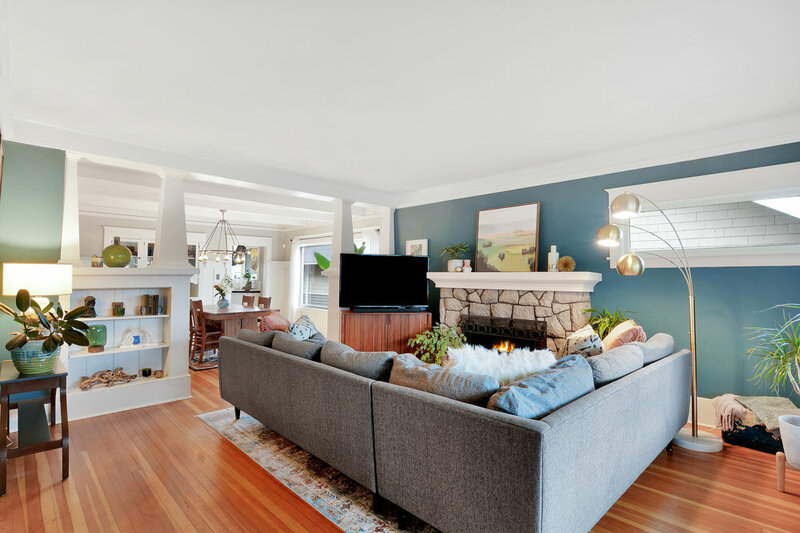 A picture window lets light in, and Craftsman details abound in the boxed beam ceiling, wainscot finished with plate rail molding, and the built-in buffet. Display your best dishes, linen napkins, or favorite objects in the buffet’s cupboards and drawers, and set a simple and pretty table. This is a room is ready for entertaining, but it’s a comfortable place for cozy family dinners too. Or, if you’re just fixing a meal for one or two, you can sit in the kitchen instead. Take a look! This eat-in kitchen offers a spot for casual meals, snacks, and a cup of coffee. The back door opens on the deck, and the interior door leads down to the finished basement. The kitchen sits at the back of the house with doors through to the deck and to the finished basement. Here you’ll find good window light, a set of stainless appliances, bright white cabinets with some glass front display cupboards, white tile countertops, subway tile backsplash, and warm neutral tones. There’s even space for a table for breakfast, coffee, or snacks; a good spot for friends to perch and visit. Don’t forget the window over the sink, one of those things that just seems right. 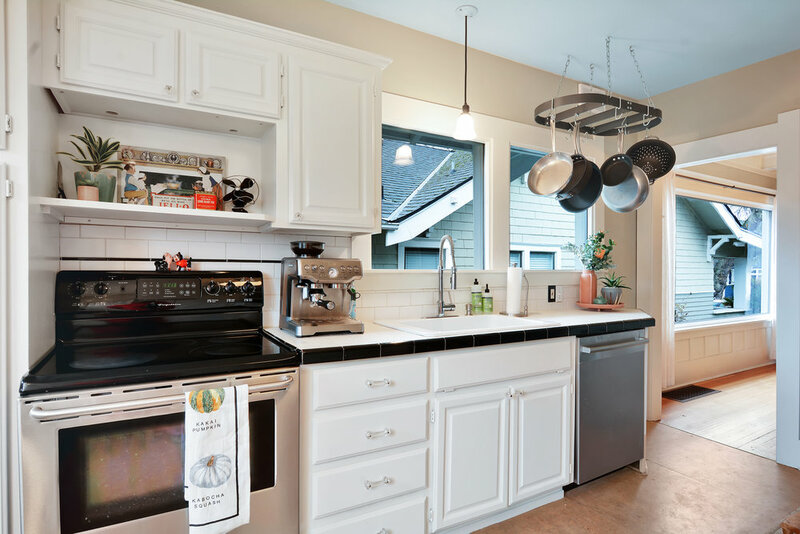 Stainless appliances and bright white cabinets create a classic kitchen. Windows over the sink bring in light. Other nice details include the subway tile backsplash, and shelf above the cookstove. This main floor bedroom sets up nicely with two twin beds for a shared room or sleepovers. One of three main floor bedrooms, currently used as a cozy music room. With three bedrooms on the main floor and additional living/sleeping space in the finished basement, there’s a chance you may set up an office, guest room, den, or studio space in one of these. You’ll see one bedroom arranged with 2 twin beds for a shared room, as well as one bedroom set up as a music room and used as an extension of the living room. Officially a bedroom, this room with its pocket door that slides back to create a wide opening to the living room, is used wonderfully as an extension of the family living space, and could make a great library, office, or music room. Fir floors, wide trim, and simple decorative molding continue in the third bedroom, seen below. One of three main floor bedrooms featuring fir floors, wide trim, picture rail, and warm neutral tones. 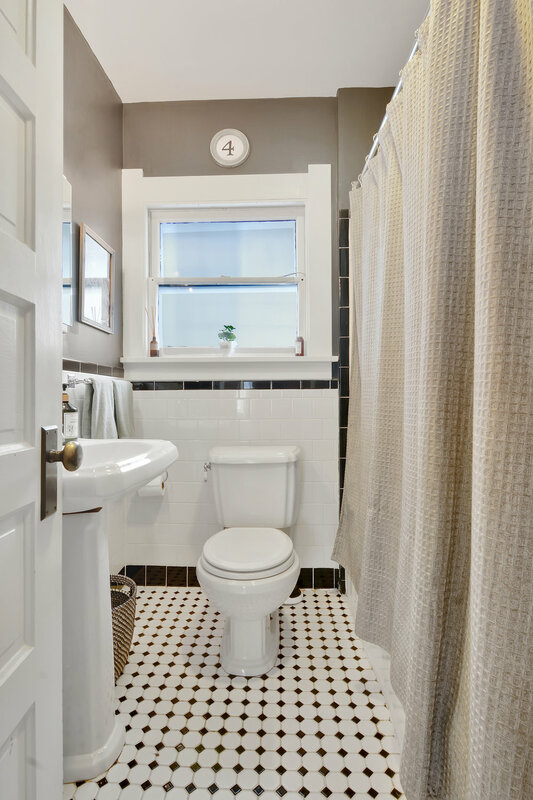 Main floor full bath with black and white tile, pedestal sink, shower/tub combo, and medicine chest mirror. Find the main floor full bathroom set in the hall with the bedrooms. Black border tiles contrast with white tile along the wall and shower/bathtub, while smaller black and white tiles continue on the floor in a definite vintage style. A medicine cabinet mirror offers some storage above the pedestal sink in this classic bathroom with era appropriate details. A half bath in the finished basement adds to the convenience of the home. We love the black and white tile floor! The finished basement offers additional living space and flexibility to the home. Notice a half bath on the left. From the kitchen take the stairs down to a finished basement. The additional living space created here offers so much flexibility to the home and keeps things from getting cramped and crowded on the main floor. You’ll find a half bath, storage shelves, room to set up an entire extra sleeping area, as well as laundry, and a workshop. A counter extends across the laundry area where clothes can be folded and organized, and there’s a stainless utility sink here too. Some natural light comes in from the windows, and with help from lamps and lighting fixtures, makes for a bright finished basement. This corner of the finished basement is set up as sleeping area. You'll also notice some built in storage shelves toward the back right. Basement laundry with counter, utility sink, and a chalkboard door leading to the back yard. 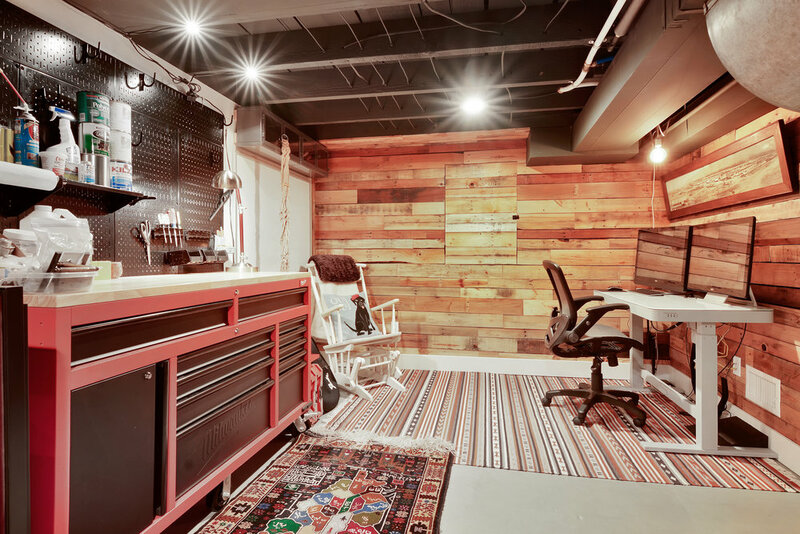 Another section of the finished basement functions as a workshop and office space. An unfinished attic with skylight and a window at each end. Accessible by stairs. Imagine how finishing this attic could enhance this North End home. With a skylight, windows at each end, and stairs leading up, this room is already on its way. Sheetrock, flooring, and some decisions about how to use the space are in order. It could become a guest loft, or set up some shelving for a bit of storage along with some cozy chairs, bean bags, and a tv for movie nights. Maybe it’s a playhouse. The space is there, and the choices are many, but there’s no rush either. There’s a whole house below that’s ready to go. Front door detail. Cedar shake siding, fir flooring, and double pane storm windows. 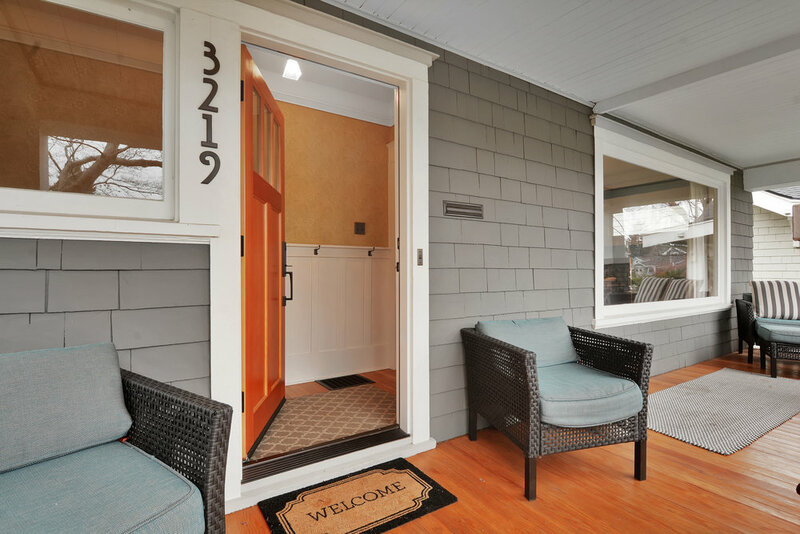 A wide front porch with a stained wood floor, deep eaves, and a spot to sit almost makes a welcome sign redundant. Come out here to sit on long summer evenings, shake off your coat and take a deep breath before going in on chilly winter days. A front porch is a place to read a book, a spot to drink coffee, a place that creates opportunities to wave at neighbors, an outdoor living room. This front porch faces south overlooking the front lawn and sidewalk. A Japanese maple bends nearby, and garden beds are waiting below. In the fully-fenced back yard there are even more places to sit and socialize or play. A back deck has space for outdoor furniture, and there’s even a patio with a pergola for more spots to sit when its bbq time. A custom playhouse gives kids their very own address with a slide. In addition, the detached 2 car garage is back here as well. This is a low maintenance area where potted plants and container gardens can add color and flavor during the growing season. We’ve been in the house and out of it, so head on to the final section to find out how this place fits into the city, what’s near, and where you could walk. 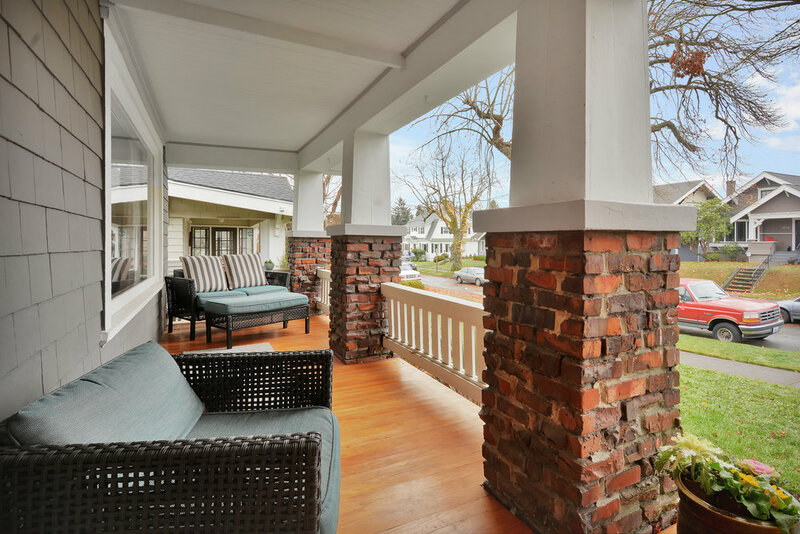 Brick and wooden pillars support deep eaves covering the porch across the front of the home. The back deck with a detached 2 car garage on the left, and a custom playhouse on the right. Just outside the back kitchen door you'll find the matching custom playhouse with its own slide. The fully fenced back yard includes this patio area with a pergola. The pergola cover may be drawn over on sunny days when shade is needed. 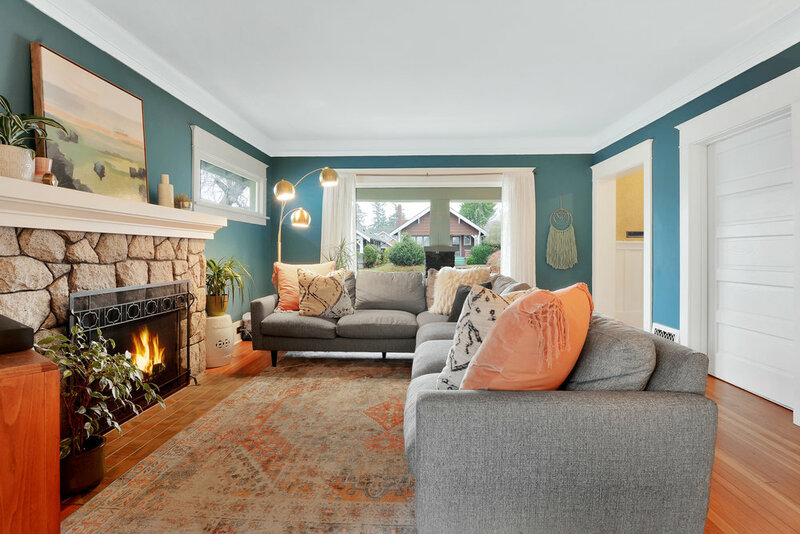 Set on a block of established early 20th century homes, this 1912 Craftsman is in good company. A planting strip between the sidewalk and the curb gives a bit of spaciousness and offers a place for additional gardening and ornamental trees. Garden gates, friendly front porches, and architectural variety make this a wonderful walking neighborhood. The Rosewood Cafe is a cozy spot for sandwiches, soup, a glass of wine, and a chat. This place is also defined and enhanced by what’s just outside the residential blocks. Step out the door and wander. You might find yourself drawn to the life of the university, to the paths and picturesque buildings, or even to the cafe where the public is welcome to come in for a cup of coffee. Maybe you’ll turn a different way, head toward the quaint 3 Bridges District with its independent businesses (salons, a coffee shop, the iconic Magoos), deep gulches, and pretty homes. But it’s likely you’ll head north and west just a few blocks to reach Proctor on a very regular basis. Any why not? With grocery stores, gift shops, restaurants, a movie theater, public library, outdoor markets, a post office, parks, and schools, it kind of has it all. Take a look at distances and driving/walking times from the door of 3219 N 20th St to some of Tacoma’s favorite spots! The Rustic Aristocrat is just a 7 minute walk away! Teaching Toys & Books in Proctor is another favorite nearby destination. Come see this North End Craftsman Bungalow in person on Sunday, January 13th from 12 - 3 pm. All are welcome! In the meantime, If you’d like to know more, call or text me, Michael Duggan, at 253-226-2787. I'll be happy to answer your questions about this home or the local real estate market in general.